Spinnerbaits were designed to solve the problems encountered by southem bass anglers in trying to fish reservoirs strewn with timber and brush. Standard or weight-forward spinners snag too easily under these conditions. The shaft of a spinnerbait is bent in the shape of an open safety pin. The bent shaft prevents weeds and branches from fouling the hook and blade. Yet spinnerbaits hook fish better than most other weedless lures because the entire hook is exposed. 1ure, it may follow and revea1 its 1ocation. Then, you can use a slower or 1ess flashy 1ure to catch it. When se1ecting spinnerbaits, consider the 1ength of the upper arm, the thickness of the shaft and the shape of the head. In most situations, use a spinnerbait with an upper arm 1ong enough so that the blade rides above the hook point. Mode1s with a shorter arm work best for he1icoptering (page 39). But if the arm is too short, it will not protect the hook from snags or provide enough stability to keep the 1ure from rolling. If the arm is too 1ong, it will reduce your hooking percentage because fish often strike at the blade. A thin-wire shaft transfers the vibration from the blade to the skirt for maximum wigg1e. And thin wire enables you to hook fish more easi1y because it collapses on the strike. A thick-wire shaft is better in timber and brush because it deflects off branches. (30) The Joker, (31) Mr. [email protected], (32) Tinsel TailTM, (33) Slot Back, (34) Switch Blade. Twin blade models include: (35) D'Crawler, (36) Maxi Twin Spinner, (37) Bushwhacker Twin (38) Go-For-It, (39) Musky Twin. Most spinnerbaits have a pointed or bullet-shaped lead head molded to the lower shaft. 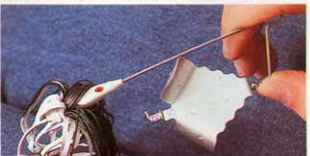 The streamlined head helps the lure snake through weeds. Some small spinnerbaits have a detachable free-swinging jig instead of a fixed head. The jig is not as weedless, but hooks fish better. Spinnerbaits came in single-blade, tandem-blade and twin-blade models. Single-blade types produce the strongest beat, and helicopter well, making them a good all-around choice. Tandems have more water resistance, so they run shallower at a given retrieve speed and are effective for bulging the surface (page 38). Twin-blade types are best in heavy cover because the dual upper shafts protect the hook better than a single shaft. Most spinnerbaits have skirts of vinyl, live rubber, bucktail, tinsel, mylar or marabou. But some, called spin-rigs, caTe without skirts and are intended for use with live bait or pork strips. 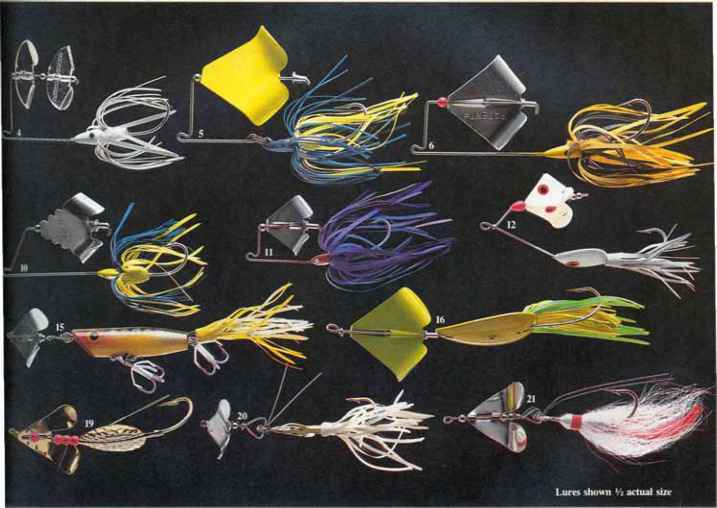 SPINNERBAITS include the (l) single spin, which has a single blade attached to the end of the upper arm with a barrel or snap-swivel; (2) tandem spin, which is similar to a single spin, but has another blade on a clevis on the upper shaft; (3) twin spin, which has two separate upper shafts, each with a single blade. BULGE the surface with a spinnerbait by holding your rod tip high and reeling just fast enough so the blades do not quite break the surface. 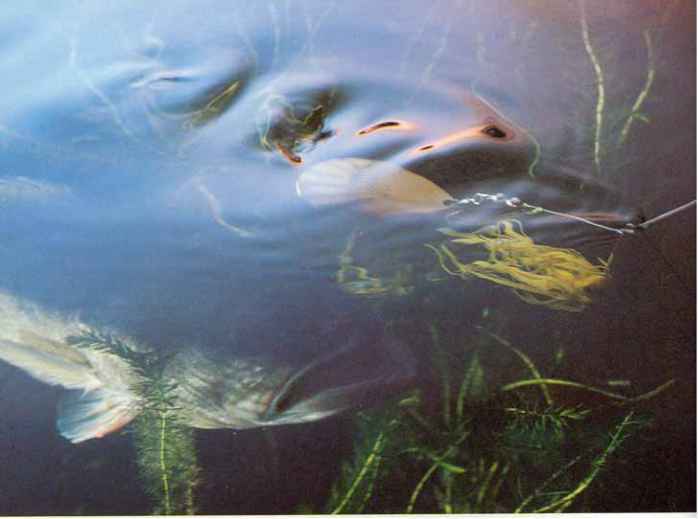 Bulging works best in warm water when fish feed actively in the shallows. Many professionai bass anglers rely heavily on spinnerbaits for fishing the varied waters encountered on the toumament circuit. The spinnerbait's versatility makes it a good choice for a broad range of fishing situations. A spinnerbait can be fished with many different retrieves. You can reel slowly along bottom, at moderate speed a few feet below the surface, or fast enough so the lure bulges or breaks the surface. You can also hop a spinnerbait a1ong bottom or jig it vertically around cover. Crappie fishermen even troll with spinnerbaits when searching for fish in open water. Experiment with different retrieves to find the one that is best for the conditions. A properly-tuned spinnerbait does not twist when retrieved, so you should tie it directly to your line. A snap or swivel will increase the chances of the lure tangling in the line. If your spinnerbait has a coil of wire for an eye, your line may pass between the arms and wedge in the coil. If this happens, cut the line and retie to elirni-nate the frayed mono. Spinnerbaits with an open slot for an eye will not catch the line. Fishermen often fail to recognize strikes when using spinnerbaits. Fish commonly strike with only a gentle nudge. Whenever you detect a pause in the beat of the blade, set the hook. Spinnerbaits often work better when tipped with a pork strip or live bait, particularly nightcrawlers and minnows. 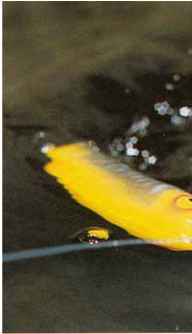 Some panfish ang1ers remove the soft plastic grub tails and substitute live grubs, worms, bits of shrimp or pieces of scent-impregnated fabric. While spinnerbaits were designed primarily for catching largemouth bass, they also work well for smallmouth and spotted bass, crappies, sunfish, northern pike, pickerel and muskies. 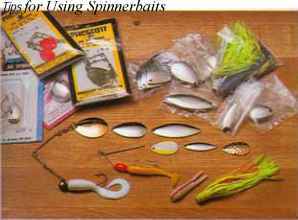 Spinnerbaits weighing 1/32 to 1/8 ounce work best for panfish, 1/8 to 3/8 ounce for smallmouth and spotted bass, 1/4 to 1 ounce for largemouths and pickerel and up to 3 ounces for large muskies and northerns. HELICOPTER a spinnerbait alongside vertical cover like a submerged tree. Keep your line taut to detect any change in the beat. Helicoptering works best in cold water or when sunlight drives fish into deep cover. CAST a spinnerbait beyond an obstruction like a stump, then retrieve 50 that the lure bumps the cover. The momentary break in blade rotation often triggers a strike. The shady side of the cover is usually most productive. ASSEMBLE your own spinnerbaits from components. 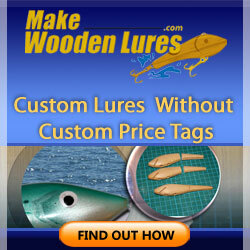 you can buy plain arms and add blades and lead-head jigs. Or, you can buy arms with the heads molded on, then add blades, swivels and skirts. REPLACE the standard Colorado blade on your spin-nerbait with a much larger willow-leaf blade. 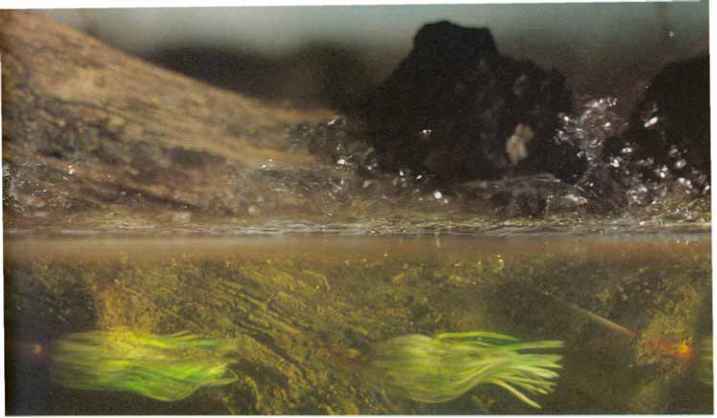 The willow-leaf blade has more flash and can be retrieved more rapidly, so it works better for locating active fish. SHORTEN the upper arm to make a spinnerbait helicopter better. For best performance, the blade should ride ahead of the hook. To make the lure drop more slowly, use a larger blade. ATTACH a stinger hook by sliding a small piece of rubber tubing over the end, then pushing the spinnerbait hook through the eye. The rubber keeps the stinger in line with the arms for protection from snags. Buzzbaits action. Some buzzbaits have counter-rotating twin blades for even more disturbance. 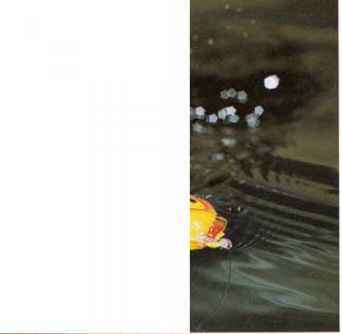 A hungry bass in the shallows finds it difficult to resist the splash and sputter of a buzzbait. Few other lures create as much surface disturbance. All buzzbaits have a double- or triple-winged propeller, called a buzzblade, rather than an ordinary spinner blade. On some buzzbaits, the blade tums on a safety-pin shaft identical to that of a spinnerbait. On others, it tums on a straight shaft like that of a standard spinner. Because the buzzbait is designed solely for surface fishing, it is not as versatile as the spinnerbait. But a buzzbait often works better than a spinnerbait for fishing over shallow, weedy flats. The buzzblade is less likely to foul in weeds or grass than an ordinary spinner blade. A buzzbait may also work better than a spinnerbait in murky water. 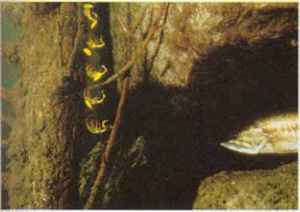 Eyen when fish cannot see the lure, they can hear the sound of the blade breaking water. Buzzbaits work best in relatively calm water. If there is too much wave action, fish do not seem to notice the surface disturbance from the lure. Some fishermen tip their buzzbaits with plastic worms or pork strips for extra action. These attrac-tors also add buoyancy so the lure stays on the surface. But if the attractor trai1s too far behind the hook, fish will often strike short. Buzzbaits have gained a reputation as one of the best shallow-water lures for largemouth bass. 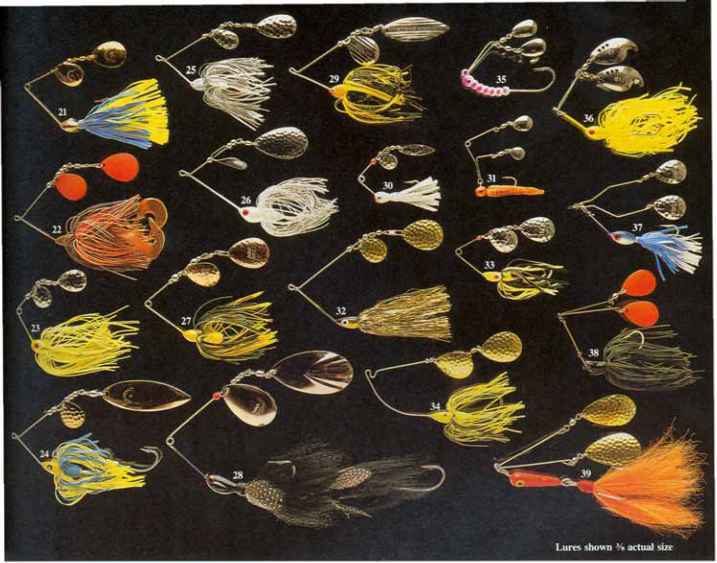 But many fishermen do not realize that these lures also work well for northem pike, pickerel and muskies. For largemouth bass and pickerel, use buzzbaits from l/4 to 5/8 ounce; for northern pike and muskies, from 5/8 to l ounce. When fishing for bass, reel a buzzbait steadily, just fast enough to keep it on the surface. For pike, muskies and pickerel, a faster retrieve is usually more productive. 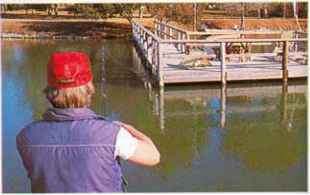 Fishing in slop usually requires a slower retrieve than fishing in open water or sparse vegetation. Dense overhead weeds make it difficult for a fish to zero in on a fast-moving lure. When a slow retrieve is needed, select a twin-bladed buzzbait or one with a wide, spoon-type body. The twin blades give the lure more lift, and the flattened body keeps it planing on the surface. The choice of safety-pin versus in-line styles depends mostly on personal preference. 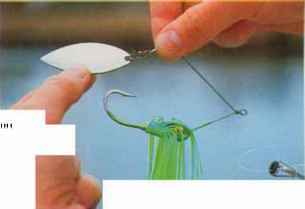 REMOVE the counter-rotating blades (aboye) from two buzzbaits by sliding off the stops. Reassemble the two lures so that both blades turn in the same direction (below). Obe altered lure will veer right, the other left. WALK the lure that veers right into hard-to-reach places on your right-hand side. Use the other lure for cover on your left. This technique works especially well for fishing under docks or overhanging limbs. so you can start your retrieve before the lure has a chance to sink. While retrieving, hold your rod tip high enough so that your lure stays on the surface, but not 50 high that you cannot set the hook. Fish are sometimes difficult to hook with buzzbaits. Because of the dense cover, they may have trouble catching the lure. They splash or swirl nearby but miss the hook. If you jerk too soon, you will pull the lure away. 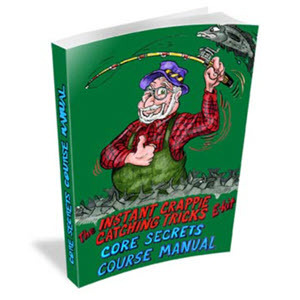 Instead, wait until you see or feel the fish grab the lure before you set the hook. To improve your chances of hooking fish, add a stinger. Rig a long-shaft single hook so the point rides up and secure it exactly the same way as rec ommended for spinnerbaits (page 39). In open water, use a treble hook for the stinger. Buzzbaits work especially well in spring, when largemouths are spawning on shallow, weedy flats. Cast beyond a nest, then reel the lure directly over it. Later in the season, buzzbaits work best on calm mornings or evenings, on overcast days or at night, the times when most predator fish prowl weedy or brushy shallows. Do not hesitate to cast a buzzbait into the thickest, most impenetrable cover, especially in hot weather. Few lures are more effective for drawing fish from beneath the slop. TUNE your buzzbait on the way to the lake by experimenting with different ways of bending the blade, then holding the lure out the car window. When the blade spins fastest, the lure is properly tuned. BEND the blade ann slightly downward so that as the blade rotates, it just ticks the shaft. The extra noise may attract more fish, especially at night. Avoid bending the arm so much that the blade cannot turn rapidly. Originally, the term plug referred to a lure carved from a block of wood. Many fishermen still consider wooden plugs the best, but most modem plugs are made of hollow plastic or hard foamed plastic. Plastic plugs are less expensive and hold their finish better than wooden plugs. Plastic plugs of a given model are more consistent in shape, density and action than wooden ones. But wooden plugs sometimes haye a better action than similar ones made of plastic. A balsa minnow, for example, wobbles more readily than a plastic minnow of the same size ood shape. Most plugs imitate baitfish, but some resemble animals like mice, frogs and crayfish. Other plugs attract fish by their action and flash, resembling nothing in particular. All plugs produce some sound that draws the attention of gamefish. It may be a high- or low-frequency vibration; a pop, gurgle or splash; or merely the sound of the hooks clinking on the hook hangers. A few plugs haye chambers filled with shot that produce a loud rattle. Some plugs are designed exclusively for surface fishing. Surface plugs work especially well when fish are spawning or feeding in shallow .water. But they will sometimes draw fish up from deeper water. Stickbait - These long, slender, floating plugs lack lips or propellers. They haye no built-in wobble, so thefisherman must supply the action. Propbait - Similar to stickbaits, these lures have a propeller at one or both ends. Crawler - A large face plate or wings on the sides make the lure crawl across the sudace when retrieved steadily. Crawlers produce a plopping or gurgling sound. Chugger - The indented face catches water when the plug is jerked across the surface, producing a popping or chugging noise. 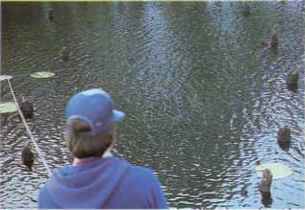 Some chuggers have a slow, swimming action when retrieved steadily. Crankbait- Most crankbaits float at rest, but some sink. All have a lip which makes them dive and wiggle when retrieved. Minnow plug - Like crankbaits, these plugs have lips and may float or sink. Designed to imitate thinbodied .baitfish, minnow plugs have an attractive side-to-side wobble. Vibrating plug - These thin-bodied plugs do not have lips. The attachment eye is on top of the head, resulting in a tight wiggle. Most vibrating plugs sink, but a few float while at rest. Trolling plug - Designed primarily or exclusively for trolling, these plugs generally have a large flattened forehead that creates a wide, erratic wobble. Trolling plugs are difficult to cast because they are relatively light, and their shape is too wind resistant. Most trolling plugs float at rest. lerkbait - These large, elongated plugs are intended mainly for catching muskies and large pike. Most float at rest, dive when given a strong jerk, then float back to the surface. Many have metal tails that can be bent to change the action. 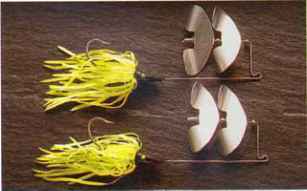 Plugs range in size from the tiny, inch-long models used for panfish to the huge, foot-long plugs intended for muskies. When selecting plugs, length is a more important consideration than weight. 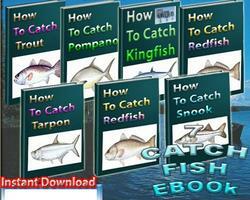 Following are plug lengths most commonly used for various types of gamefish. 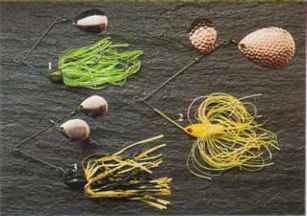 How to use a safety pin spinnerbait? How to tie overhead spinnerbait bucktails? How to build your own artificial bait? What type of artificial lures for sunfish? How to catch muskies on spinnerbaits? How to manufacture artificial lures? Where can i find rubber buzzbait and spinnerbait skirts? How to attach a stinger hook? How to set up strike king spinnerbaits? Does probass sell bush whacker spinnerbaits? How to attach hook on h&h spinner bate? How to hook Safety Pin Spinner Bait ? How to tie spinner bait on fishing line? How to make roto lure blade? How to bend or make a buzz bait? How to draw artificial bait? How to attach an open safety pin spinner bait? Who designed the H&H spinnerbait? When catching muskies is it better to use bait or artificial lures?